Is Valve hinting at a Half-Life 3 Alternative Reality Game? You guys; You'll convince yourselves that a change in wind direction is a confirmation of Half-Life 3. Although this time we have to admit that it looks like Gabe Newell and his team might be giving us the old wink wink, nudge nudge. 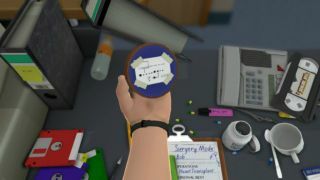 The latest hint dropped after someone stumbled on a mysterious note in the Surgeon Simulator 2013's Team Fortress 2 DLC, and now everyone is convinced that Valve is about to do another AGR (Alternative Reality Game) like it did with Portal 2, with a treasure hunt taking place between the virtual and real world. The Korean text apparently translates as "The time is". Those dots, meanwhile, are supposed to represents our solar system of planets. Someone over at RLLMUK reckons they've cracked the code, and that it spells out September 26, 2013. Which also comes very close to Steam's 10th birthday.